A dozen red roses sent with love to share a romantic message with your special someone. 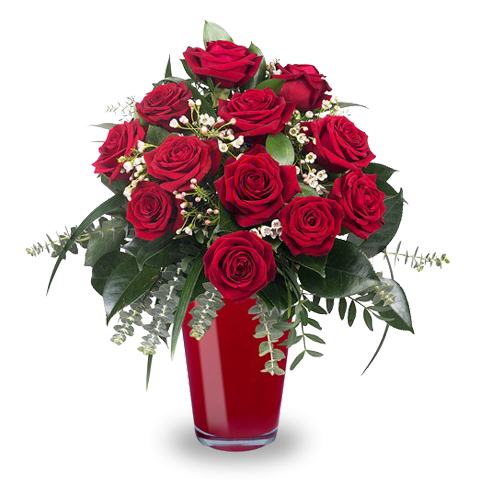 Send this rose bouquet today using FloraQueen’s international flower delivery service to over 100 countries. 7 Days freshness guaranteed on all bouquets. Sending same day birthday flowers is easier than ever with FloraQueen. If you’ve just realised that today is someone special’s birthday and you don’t have a present we can help. Thanks to our same day delivery, your bouquet will get to its destination today. With our busy lives, forgetting an important birthday can happen to anyone of us. That’s why we offer this selection of flowers with same day delivery. A wide variety of bouquets at your disposal to surprise a family member or friend with a birthday today. Don’t leave someone special without a birthday present due to a simple oversight on your part. The scent and the splendour of the flowers will send your happy birthday message like no other. Send your same day birthday flowers now! In our catalogue of same day birthday flowers we have all sorts of bouquets and bunches that can match your recipient’s personality. Perhaps you have a relative who would love the bold bright colours of gerberas or maybe a beau who would appreciate an elegant arrangement of roses and lilies. It doesn’t matter what kind of birthday message you’re sending we can help you make it the right one. Why not celebrate their special day in style? We have lots of ways that you can upgrade your last minute birthday surprise to make it a truly memorable gift. When you’ve selected your bouquet simply browse our range of chocolate boxes, wine and plush toys to bring an extra big smile to your loved one’s face. Of course, it also wouldn’t be a birthday without a birthday card and we have a broad variety of themed cards that can be sent with your glorious bouquet. Never miss a birthday again!